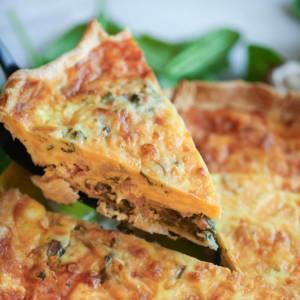 This Ultimate Quiche is perfect for special occasions. It makes two pies, so it’s perfect for feeding a crowd, freezing a pie for the future, or sharing with another family! Preheat oven to 375 degrees. Cook the bacon (our favorite way is in the oven, but you can do it on the stovetop if you prefer). Drain on a paper towel, chop or crumble, and set aside. Sauté spinach in bacon drippings. Add onions and cook until softened, then add mushrooms and parsley. Remove from heat and stir in the ham and bacon. Add the sour cream to the mixture and season with salt and pepper. Divide into each pie crust. Sprinkle the cheeses over the pies. Mix eggs and half and half. Pour over pies. Place pies in oven (on a baking sheet if they’ll fit–it will keep any overflowing eggs from stinking up your oven.) Bake 45-50 minutes or until tops are puffed and golden brown. Let stand 5-10 minutes. Each pie serves 8. If reheating, cover pie with foil and bake at 325 for about 20-30 minutes, checking frequently to make sure it’s not getting too brown. You could also pop it in the microwave, but individual slices do better in the microwave than an entire pie.